I was not a student of Dr. Ewert. My interactions with him were mainly during my years at the MB Herald, in the capacity of editor to writer, and in this capacity I found him not only willing to serve whenever asked, but wonderful to work with as well. His copy was always on time or early, and so precisely written it needed virtually no editing at all. Last year, when we asked to reprint an article, “Does the resurrection make a difference in everyday life?” which had first appeared more than 20 years earlier, and said that we needed to shorten it and also update bits of the language here and there, he readily granted permission, and trusted us to make the changes. To my recollection, he said he didn’t even need to see the revised piece, although we sent it to him for his review anyway. He was polite and somewhat formal in his correspondence, but he never failed to include some affirming or grateful word about the ministry of the magazine, and coming from him, this was valued encouragement indeed. But my larger gratitude concerns David Ewert’s place in our denomination, where he was known not so much personally as broadly, by all of us, for his many contributions. He was born in 1922, served the Mennonite Brethren and wider church some 70 years: 25 years at the Mennonite Brethren Bible College in Winnipeg, and also as professor at Eastern Mennonite Seminary in Harrisonburg, Virginia, at Mennonite Brethren Biblical Seminary in Fresno, California, and as visiting teacher in other schools in North America and internationally. He preached in many churches, and wrote more than 20 books. 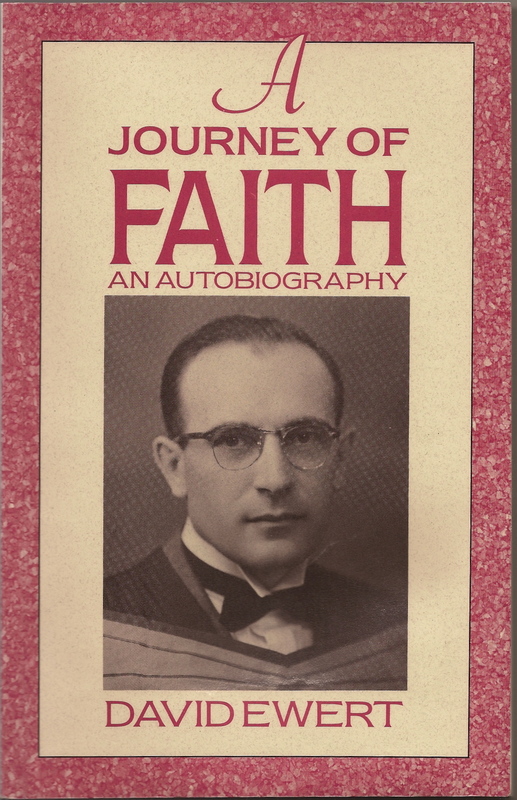 Some years ago I read, and enjoyed, David Ewert’s autobiography, A Journey of Faith (Kindred, 1993). I want to mention two things that I’m grateful he impressed upon the MB denomination. One concerns his influence in weaning us away from the dispensational approach to the Bible and into a sounder understanding of the Book of Revelation. No question, he admitted, caused as much controversy in his experience as teacher and preacher. I’d grown up with those charts too but was not sorry either to see their demise. A large one drawn on cloth hung on the wall of the conference archives room for some time, where it recalled for me, whenever I saw it, the intensity of this interest in the past. But its being there also symbolized the move away from the “nonsense” that had beguiled and consumed us for a time. I have found that one can bury one’s head in a lexicon and come out with the glory of God…. It didn’t happen over night but I see it more clearly now than in my younger years, that intense academic efforts do not endanger a person’s devotion to God. In fact, I have found the opposite to be true. When one offers one’s academic activities up to God as a daily sacrifice, they become a means of grace. My patience tends to wear thin when I encounter students who in the name of piety shy away from the rigors of study. May the work and memory of David Ewert continue to be blessed among us. This entry was posted in Books, Mennnonite Brethren and tagged A Journey of Faith, David Ewert, eschatology, Leaders Who Shaped Us, Mennonite Brethren by doradueck. Bookmark the permalink. My personal interactions with David were few- but you reflect the spirit of them very well. We have lost another of our solid leaders from a passing generation. I hope we are replacing them. Thanks Dora for this wonderful reflection on the legacy of David Ewert. Ironically, my husband was enjoying reading David’s autobiography “A Journey of Faith” the day David took ill. How thankful we both are that David was willing to share some of his life story. We appreciate the Christian grace and stamina with which he faced the challenges associated with being an academic leader. Thanks, James, and Gay Lynn, for adding your comments. He was well known by so many, and yet in many different ways. Now that he’s gone, it’s a privilege to get to know him all over again through the reflections of other people. Thank you for sharing this. And thank you for your comment. As a grandson you had a unique window on his life. My sympathies in your loss, and wishes that you will be inspired in all the best ways possible by your memories.